I'm a recent newcomer to baking my own bread. I've made 3 batches so far. For the first two, I followed the recipe and directions included with a Kenwood Chef Mixer I recently bought. Today, I followed a recipe from a Le Cordon Bleu book. My problem is that I'm finding that the bread doesn't really rise enough and is a little too solid/dry. I've been using Hovis bread flour and dried yeast. All quantities and times are kept as close as possible to the directions in the above mentioned 'guides'. Anybody have any suggestions? probably let it rise longer. For rolls, bake just for 15-20 minutes at 230C, 210 Fan/450F/Gas Mark Turn out the bread and cool on a wire rack. What I find jumps out at me here is that they don't tell me to knead a second time after the first doubling in size. My recipes did and it's after the second knead, which I don't think was too much on my part, I found the dough to be reluctant to rise. Maybe I shouldn't knead a second time as this recipe suggests but my mum said that she's never heard or not kneading a second time. She would have made bread and watched her mum before they had mixers. What do you think and thanks for the reply Wunderdave. Last edited by Ader1 on Fri Oct 26, 2012 4:07 pm, edited 1 time in total. The second rise is crucial. It has been my experience that you get much less oven spring than you might hope, so you have to make sure that the bread is the size you want before baking it. I knead my dough a second time before letting it proof/rise before baking and it works out. Knead dough initially, let rise, punch down, knead and form into loaves or rolls, let rise, bake. Ader, I had never made successful bread before I came here, but as some of my posts will attest, I have since! The link wheels supplied is the one I use for all of my bread, I do not buy shop bread anymore and make all dinner rolls etc from this or the famous soft rolls recipe, I think it is a sticky above. Ignore timings, look at your bread, there are so many variables such as flour, oven, air temp etc etc you will eventually get a feel for it. I still have disasters, I think we all do, but read loads and experiment more.. Good luck. Last edited by denty632 on Sat Oct 27, 2012 6:16 pm, edited 1 time in total. I notice that in your recipe, the dried yeast isn't soaked and allowed to bubble etc before adding to the flour. First time I've seen that. Just one question if I may? I've got quite a bit of dried yeast already. Two small tins. Would a sachet be around 1 table spoon full? Thanks. You don't say where you are in the world? Here in the UK we have various brands of instant dried yeast that often come in 7g sachets. They are different from the normal dried yeast that comes in tins. 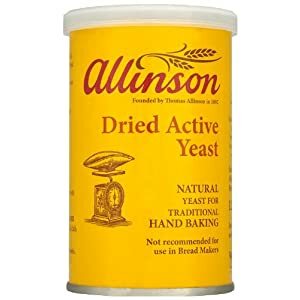 You can of course use the yeast in tins, but you need to activate it in some of the water (at blood temperature) and then (say) add it to a proportion of the flour (maybe half) and leave it to make 'a sponge'. You would then add that to the main ingredients. That said, if you're not in the back of beyond, I suggest that you try the instant yeast (or fresh yeast). One way or the other, stick around and we'll have you making decent bread in no time! Last edited by wheels on Sat Oct 27, 2012 3:46 pm, edited 1 time in total. I just noticed your post denty632. Thanks for the tips and encouragement. I have used a similar tin before, I have gone back to the easy baky yeast. With the tinned, I didn't make a sponge, but will try that, thanks Wheels, but measured my warm fluid first and then added the yeast. I then went on to measure the rest of the dry ingredients. Once I had done that, the mix was bubbling well and ready to add to the dry. I sometimes added my sugars to the yeast/fluid mix to get things moving. As for measuring, I bought a cheap set of digital scales on eBay when I first got into sausages, I have since upgraded. When you are measuring 7g of something they are INVALUABLE. Have a go at a sponge, try my method, it might work for you, keep in touch with the board and good luck! Hi Ader1, I use the same yeast as yourself and find it quite suitable for breadmaking. There are so may variables involved in making bread - such as moisture, temperature etc. I've found that my loaves haven't been rising as much this week, but i put it down to a drop in temperature. Once you have made enough bread loaves you will get a feel for things going right/wrong and will be able to act accordingly. Don't forget that salt inhibits yeast growth, so this could be a factor in your bread rising. You could try and allow the yeast to activate in a glass of warm water and add a few pinches of sugar that the yeast can feed on, this will give it a good start so it can hit the ground running, so to speak. If the book has been produced by the French, it's quite possible they are using French flour which has different properties from English flour. That could be worth checking.